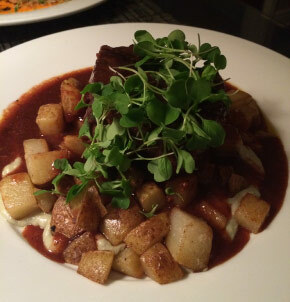 Cozy, intimate and classy are three words that aptly describe the ambiance at 54 Main Bistro. It&apos;s the perfect setting for a dinner date with your special someone or just a relaxing evening out with friends or family. Located in a historic waterfront Victorian home in downtown Hobart, 54 Main Bistro is a farm-to-fork restaurant that prides itself in serving eclectic, fresh and unique dishes. Chef Scot Hinkel changes the menu every week, creating appetizers, entrees and desserts that feature local ingredients whenever possible. Recently, my co-worker, Staci, and I had the opportunity to dine at this amazing restaurant. 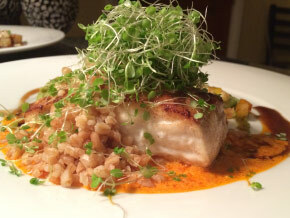 We were eagerly anticipating trying out Chef Scot&apos;s culinary creations, and our meal exceeded our expectations. We were seated in a cozy room next to windows overlooking Lake George. On the wall was a huge picture of historic Hobart. 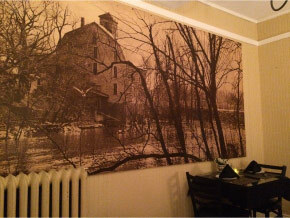 Owner Linda Papp explained to us that the picture was of the old grist mill that was located on Lake George. She also pointed out the house that we were sitting in. As I love historic photos, I found this fascinating. As we munched on the warm bread and seasoned oil, our awesome server, Tony, brought out our first course, duck enchiladas. They were almost too pretty to eat, but the aroma was so enticing that we couldn&apos;t wait to dig in. These delectable treats were filled with perfectly seasoned, tender duck and were garnished with freshly made pico, queso cheese and a white chocolate tomatillo sauce that was to die for. Next, Tony brought us our entrees. Staci had selected the Hapu&apos; upu&apos; u, otherwise known as Hawaiian Sea Bass, which was served with organic broccoli puree, succotash and Green Sense Farms micro watercress. It looked mouthwatering! I had ordered the locally raised grass-fed filet mignon, accompanied by diced potatoes, peppercorn demi glace and Green Sense Farms micro arugula. It was tantalizing! Staci took her first bite and literally almost cried because she was so amazed at the explosion of flavors in her mouth. "It&apos;s sooooo good!" was all she could say. I cut into my perfectly cooked filet mignon, which was by far the best filet I had ever tasted. The peppercorn sauce complemented the beef and potatoes superbly and the arugula added that extra freshness to the dish. 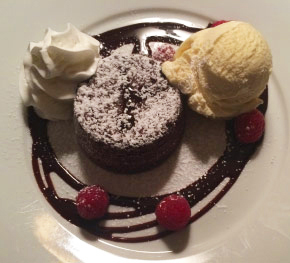 For the finale to our amazing meal, Chef Scot created a beautiful Ghirardelli molten cake for us to share. It was the perfect dessert - warm chocolate cake with a velvety center, a huge scoop of luscious ice cream, freshly made whipped cream, chocolate sauce and raspberries. Its beauty was only surpassed by its out-of-this-world flavor. We left 54 Main Bistro happy, pleasantly full and plotting our next visit. We both gave both the ambiance and the food two thumbs up. We bet you will, too!